Last weekend my wonderful husband and my dad installed our [my] new oven! Although the kitchen is a long way from finished, it is so exciting having a lovely electric oven to cook in. So after watching Saturday Kitchen and seeing Rick Stein eating a quiche – I decided that it would be the first thing I needed to bake. I don’t know whether it is proper to call it a flan or a quiche so I end up calling it both. I am sure there is some kind of difference but I haven’t noticed one yet, I just use them interchangeably as to whether I am feeling posh or not. You can put whatever filling you like into it such as asparagus, mushroom, bacon… – as long as you bind it all together with egg it should be fine but this is my favourite mix. Roll out the shortcrust pastry about 5mm thick and use to line a pastry tin. Make sure you have no holes at all in it and it is pushed back into the edges. * Trim the top of the pastry flat with a knife and gently prick the pastry with a fork, but be careful not to go all of the way through. Put a sheet of greaseproof paper over the pastry and fill with baking beans or something else like dried beans to weight it down. If you don’t put the greaseproof paper in then the baking beans will stick to the pastry. Cook in the oven for 10-12 minutes till the pastry starts to get a bit of colour, then take out the baking beans and greaseproof paper and bake for a further 5 minutes. 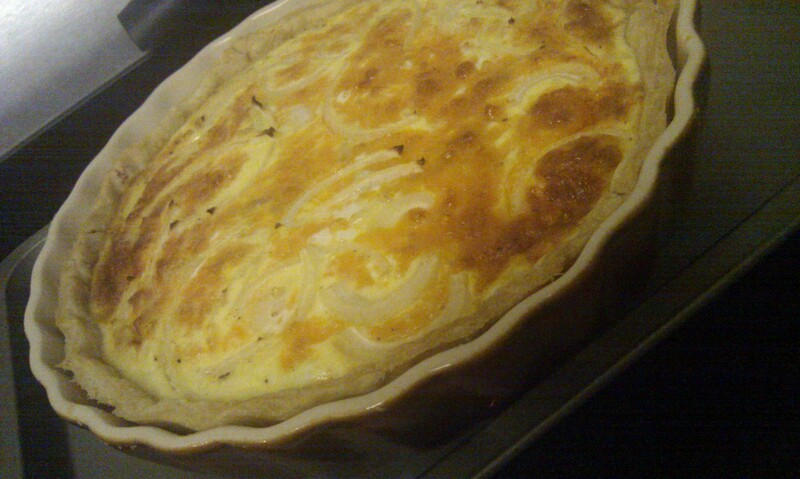 Let the pastry case cool a little then fill it with grated cheese, cut up pieces of ham and slices of onion. Make sure there is plenty of filling inside but not higher than the edge of the pastry case. Bake it in the oven for approx 35-45 minutes. You will be able to tell when it is done when it stops really wobbling and looks a lovely golden colour. Let it cool a bit before you cut it. I like to eat it warm with chips and baked beans, but is also great the next day straight from the fridge. *A little tip – use a spare bit of pastry to push it to the edges with.